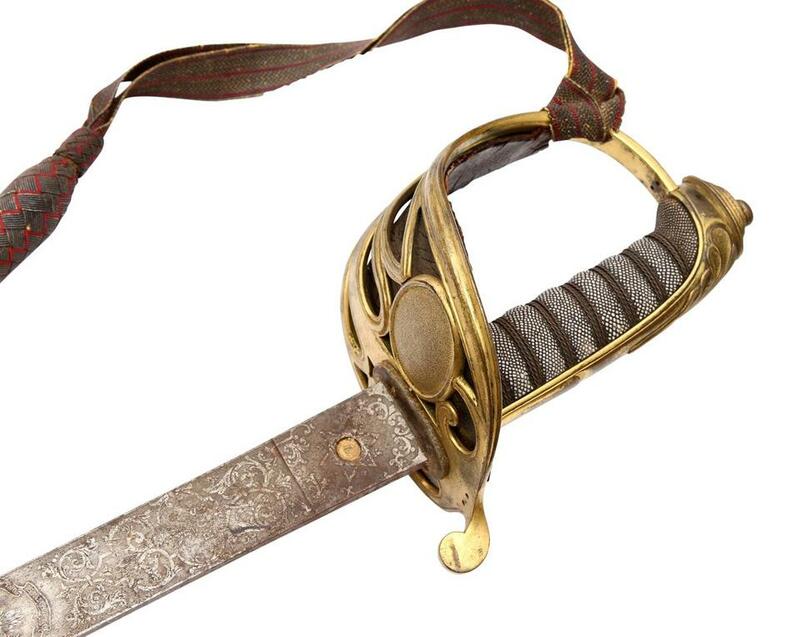 The sword, long thought to have been lost, was used by Colonel Robert Gould Shaw in 1863. After the sword of Colonel Robert Gould Shaw was gifted to the Massachusetts Historical Society by descendants of Shaw’s sister earlier this year, staff from the organization used their detective skills to scour through old documents and trace the journey of the weapon from its origins in England to its hiding place in the attic of a family home. The sword, long thought to have been lost, was used by Shaw in 1863 as he led the 54th Massachusetts infantry, a courageous group of black soldiers, into battle at Fort Wagner in South Carolina. The rare weapon — a replica of it can be seen on a bronze monument of Shaw and his infantry that stands outside of the State House, on Beacon Hill — was stripped from the colonel after he was shot and killed on the battlefield by enemy troops. The stolen sword seemed doomed to obscurity and left history buffs collectively scratching their heads as to its precise whereabouts, with few clues to go by. But when the sword fell into the hands of Anne Bentley, curator at the historical society, and staff from the organization, they set to work to unravel the mystery. The artifact was discovered in an attic and is being called a “once-in-a-lifetime” find. November 1860: Robert Gould Shaw is enlisted in the Seventh New York Infantry Regiment. May 1861: Shaw is commissioned second lieutenant of Company H of the Second Massachusetts infantry, an elite regiment, according to the historical society. July 1861: Shaw is commissioned first lieutenant of the same regiment. August 1861: Shaw moves up the ranks and is commissioned captain before his name is floated to command the country’s first African-American regiment, according to the historical society’s website. March 1863: Shaw is commissioned as a major for the newly formed 54th Massachusetts infantry, who he would later famously lead into battle at Fort Wagner, in South Carolina. April 1863: Shaw is commissioned colonel of the 54th Massachusetts. It’s around this time that Shaw’s uncle, George R. Russell, ordered an officer’s sword from Henry Wilkinson, a master swordsmith from England. July 1863: Shaw writes to his father: “A box of Uncle George’s containing a beautiful English sword came all right.” According to the historical society, this is Wilkinson’s sword number 12506, a regulation infantry sword with the initials R.G.S. — Robert Gould Shaw — etched on it. July 16, 1863: The 54th Massachusetts participates in the Battle of Grimball’s Landing, on James Island. Historians say Shaw likely used his sword in this battle, which was the first experience “under fire” for the regiment, according to the historical society. July 18, 1863: The assault on Fort Wagner takes place, and Shaw is shot in the chest while standing on the parapet, “sword in hand,” the historical society said. “Overnight, his body was robbed of personal effects and arms and stripped to underwear.” Sources, the organization notes, have differing theories about who the culprits of the theft were. July 19, 1863: Shaw is buried in the rifle pits with his men. In July , upon leaving the service, the late Assistant Adjutant General was charged by General Paine with the duty of restoring the sword to Colonel Shaw’s father, and upon arrival at this home, opened a correspondence with Mr. Francis George Shaw informing him of its recovery. The sword in question proved to be the one carried by the gallant colonel and was identified by the initials R.G.S. delicately etched upon the blade. June 3, 1865: A letter written by Brigadier General Charles Jackson Paine to his family corroborated Solon’s account. Paine said the sword was reportedly in the possession of “a rebel officer,” according to Bentley’s notes. Paine sent officers of the “US Colored Troops” to retrieve the sword and bring it to him. The home was empty, but the sword was found after the area was searched. March 2017: After a long gap where the sword’s whereabouts remained a mystery, it’s finally found in the attic of the home of Mary Minturn Haskins, who was married to Robert Bowne Minturn — Colonel Shaw’s sister’s grandson, and the father of the donors who gifted the sword to the historical society. The family presumes that the sword ended up in their mother’s home because it was passed on to their father. The sword might have hung on their father’s childhood bedroom wall, the family said. April 17, 2017: The family gifts the sword to the Massachusetts Historical Society, as part of a larger gift including papers and portraits. July 18, 2017: The sword will go on display at the Massachusetts Historical Society, more than 150 years after it was stolen from Shaw.